VietNamNet Bridge - Vietnam may sue the US at the World Trade Organization (WTO) if the US Farm Bill adversely affects Vietnam’s exports. Tra fish export companies in Mekong Delta have been warned about the disadvantages of exporting tra fish to the US because of stringent provisions set by the US Farm Bill. Dien Dan Doanh Nghiep quoted a source from VASEP (the Vietnam Association of Seafood Exporters and Producers) as reporting that the US is likely to add Vietnam’s tra fish into the list of catfish from September 1, 2017 (in the past, the US called Vietnam’s tra fish exports to the US ‘pangasius’, not ‘catfish’), though domestic production and imports will be put under the USDA. In 2016, Vietnam’s tra fish export turnover reached $1.7 billion, an increase of 7 percent over the same period last year. The US market consumed 23 percent of Vietnam’s exports, and China and Hong Kong 17 percent. Nguyen Chi Thao, deputy general director of Can Tho Seafood Import/Export, said most export companies have material growing areas with high-quality farming processes, so there is no need to worry about origin tracing. The processing also meets high standards. However, the Farm Bill sets many other stringent provisions. For example, treated water, not river water, must be used when carrying fish to processing factories by boats. After fish is carried to factories, the water used during transportation must be collected for treatment. These are heady requirements for Vietnam’s companies. The exports to the EU and ASEAN have decreased, while an increase has been seen in the US and new markets. According to the Vietnam Pangasius Association, if exports to the US market decrease because of barriers under new regulations and high anti-dumping duties, it is highly possible that the plan of exporting $1.7 billion worth of tra fish would be unattainable. With anticipated stringent provisions, Vietnam’s tra fish exporters are hesitant to sign contracts to expand farming areas. 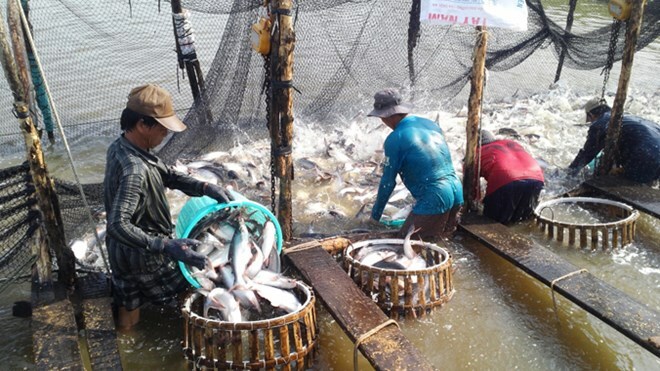 Vietnam’s tra fish industry is facing difficulties, including technical barriers and campaigns by some foreign media channels to blacken Vietnam tra images in the European market. With the Farm Bill, FSIS will take samples from 100 percent of Vietnam’s export consignments for testing. MARD has drawn up three solutions to deal with the US catfish monitoring program under the Farm Bill, according to Tien Phong. Vietnam will intensify lobbying of US officials and partners to show that the catfish monitoring program is expensive, unnecessary and should be abolished. “Vietnam may sue the US at WTO if the Farm Bill affects Vietnam’s export,” said Deputy Minister of the Ministry of Agriculture and Rural Development (MARD) Vu Van Tam.